Celine Dion’s new gender neutral clothing line for children, Celinununu, was launched with an ad that begs a response. In the past month, this official post has racked up 1,337,129 views. At one level, I am averse to even bringing attention to both her product and her message and have held off for just that reason. At another, I feel compelled to push back. Sauntering through the nursery, she removes a pouch filled with black glitter and blows it across the room, replacing the infants’ pink and blue sleepwear with black and white garments, rendering the infants in their bassinets genderless and gray. A voodoo doll appears in one of the bassinets. Then (taken aback at the arrival of two security guards) she confusedly wonders, “I can’t believe they called security! I mean – come on! I’m Celine Dion.” At which point, she’s hauled off to jail threatening to call her agent. Dion would have us believe she is saving the planet by striving towards a non-binary world. She wants to promote individuality, help children rid themselves of stereotypes. “Celinununu is about people. It’s about hearts. It’s about humanity,” she says on an official video. “And mostly it’s about choice. It’s not just about clothes…It’s about letting children find their own true essence – free…from stereotypes.” Here words are hip and current. She has the lingo down. But her thinking is as dark as the commercial it spawned. Click through to her site and you can buy your child a leather jacket for $290, an overall for $115, a sweater for $87 and more. But the price tags are the least of it. The monochrome line (aside from a rare colored item) includes images of skulls (for infants too) and the Red Cross emblem in black and white, baggy pants that replicate drop-crotch prisoner trousers, an image of a child with antlers, another of an infant with a “devil horn hat” and then some. “New Order” is written on many of the clothes. She is Celine Dion and she is going to save us all from our own selves. What of the child models? Some are tattooed, some have partially shaved heads. Most have wild hair and blank stares gazing into infinity. Barely one smiles other than a few holiday additions to the home page. Intimacy and connection appear to be beyond their scope. The images are suggestive of children raised by wolves. Much has been written and spoken about the clothes and perceived symbols they embody. I am particularly interested in the thinking that underlies her campaign. It is as dark as the commercial itself. Who Will Transmit Moral Values If Not Parents? I doubt Celine Dion is taking this statement in the way Mead suggested it. 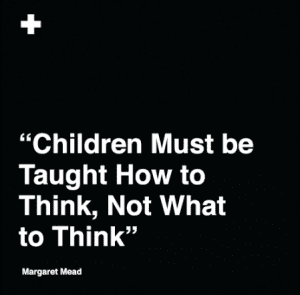 Mead as an academic – albeit of disreputable repute – was, I believe, speaking of pedagogy. Dion is using it to assert that we not reach conclusions for our children, not define them by our own “bigoted” set of assumptions. Rather we should allow them to discover everything for themselves. This is alogical and morally bankrupt. Of course the conclusions and choices children ultimately arrive at will be their own. Every person is born with free will. However that freedom does not absolve parents of the obligation to give their children a moral framework for life. Must every child invent the wheel? Must each be an Abraham who discovers G-d by contemplating the movement of the sun through the heavens? Certainly not. When everything has to begin with the individual child, when his or her ancestors and lineage are “only a fraction of their universe,” we abandon our children to a state of perpetual startup. Thus to refrain from educating our children is a form of neglect. Child-centered education makes children responsible for their own learning and own outcomes. That’s a lot of responsibility on their small shoulders. A child who grows up without containment, without parents who impart a value system, is someone with a lot of uncertainty and fear. I remember reading a short story years ago about the trauma of an un-parented childhood. What opens with the author’s apparently idyllic life – hours to roam with her siblings and the freedom to do as they want – unravels into the horrors of neglect as substance abuse, affairs, a divorce, a random stream of strange men and eventually the disappearance of their mother consume their lives. We need our parents and we need parenting. It all reminds me of the recent fiasco with comedian Kevin Hart. He backed down from hosting the 2019 Oscars because of the outrage directed at him for joke-tweets from years back. In those jokes, he expressed his desire that his (then) three year old son not be gay. My point here has nothing to do with the perceived morality of sexual orientation. What intrigued and disturbed me most was the indignation that he, Kevin Hart, dared impose his own values on his own child. This is preposterous. 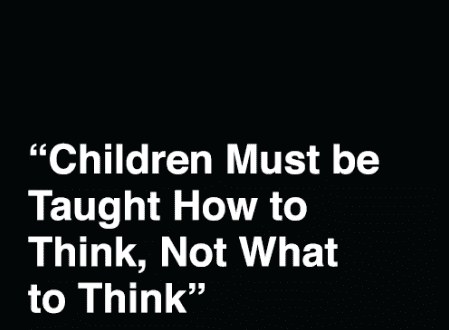 A cultural premise has emerged that our children, well…they are not really our children. At one level this is accurate. G-d is the third and ultimate Parent. But, and it’s a big but, G-d placed the soul of each child into the care of that child’s father and mother. That makes three parents. Not three thousand or three million or three billion! Each child is best served by having only three parents. It is an intimate bond that works from the inside-out, bottom-up. This is how we build and repair the world. Even a mushroom is not entirely up to itself. It came from somewhere. You can call that Source anything you like. I call it G-d. We come from G-d. Are answerable to G-d. And are created to align ourselves with His higher purpose for us as individuals and the world at large. Pharaoh, king of Egypt, described by Ezekiel as “the great crocodile” got it wrong when he said, “”My River is my own, and I made myself.” Just as G-d made the Nile and Pharaoh, so too did He bring each of us into being. We did not create our beginning. Nor do we single-handedly create our future. G-d is not our Cosmic Bellhop. Life is infinitely more complex than our willing our future and having our Creator tow the line. G-d has a plan for each of us that is far higher than that which we hold for ourselves. If the premise about self-determination and being entirely up to ourselves were true, therapists’ rooms would not be overflowing with individuals struggling to work out the impact of their past on their present and future lives. The notion that we are entirely self-made has thrust millions into the discomfort of swinging between victimhood and delusions of grandeur. Buying in to the lie that you are all-powerful results in resentment and victimhood when someone or something interferes with that supposition of self-determination. 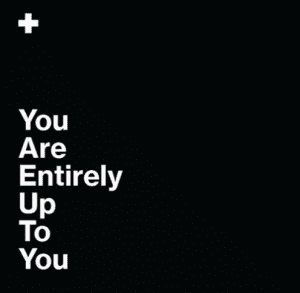 Deeper than this, the notion that “You are entirely up to you” removes both G-d and parents from the child’s consciousness. What happens when you do that? Knock out G-d and you get moral relativism. Knock out the nuclear family and you get children who lack the grounding and safety of lineage, even of basic social skills. You have children who lack the ability to connect. You have feral children wide open to manipulation by people like Dion who can then supplant children’s true needs with image, lies and consumerism that stands to make people like her a lot of money. So of course we have to impart our values to our children! And until they’re old enough, we have to insist on their complying with those values. The Hebrew word for education, chinuch, is rooted in the word lachnoch which means to train, inaugurate or dedicate. We inaugurate our children into a meaningful life as we understand it based on what we were taught. We raise them with that sense of purpose and until they are old enough to forge their own path, we train them so that they have the tools, resilience and inner strength to be truly free. Who else will do this job if not me? Celine?! The government? No…No! NONONO. Silly. I can’t believe you’d think otherwise Celine! I mean – come on! I am my own child’s mother.